Today, online-learning platforms are flexible, dynamic and can be accessed on the user’s preferred device, including smartphones and tablets. Content can also come from a variety of sources, making the information more dynamic and varied for learning. For everyone that is looking for a more easygoing platform to learn valuable information, share knowledge and create content, communicating with like-minded people, we have the right app for that. Let’s see what this platform is all about. What is Heuro all about? This is one amazing social and educational platform that is offering users to easily connect with people worldwide and come together to create, learn and share their valuable information, knowledge, and ideas with like-minded people that share their interests. On this easy to use an app developed for both IOS and Android users, all users are able to grow their intellect and creativity, satisfying their educational needs, nurture and grow their own mind such as the community as well. With the app, users will interact with information, ideas, and knowledge, sharing and receiving valuable content. 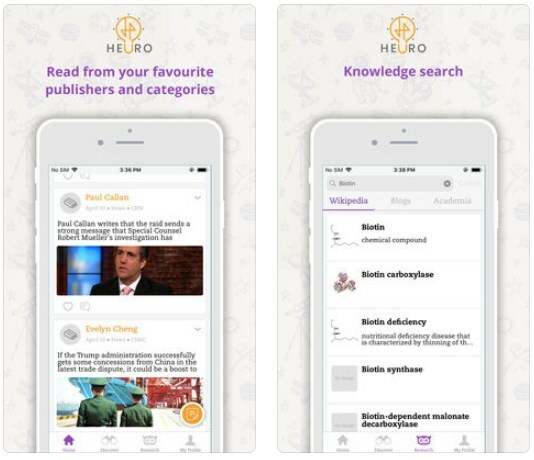 Heuro as the social learning platform for IOS and Android offers users that like to learn and share knowledge, different features that will help them connect with educated like-minded individuals. The app is providing users with instant gratification to their curiosity and creativity by allowing them to use a lot of educational tools. On the app users are able to use the organized feed that will provide them with the latest news and knowledge from many blobs and news publishers, all in an organized way, expanding their diverse knowledge and information. 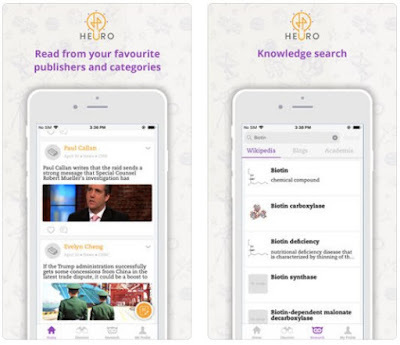 Users can feed their curiosity on the app with the app’s knowledge search feature where all search results are organized systematically like Wikipedia to blogs, to academia, to books, deepening their knowledge for different topics. The app offers users to take instant notes as well just in one click and add those notes easily to their favorite notes app. Users can mobile blog in the app, create, publish and share their articles, papers or essays anytime they want directly from their phone, documenting their creative and intellectual life. Download it for free now on Google Play and App Store to create and learn from other people!